This year, Book Riot has made it a priority to read and share more books by authors of color. 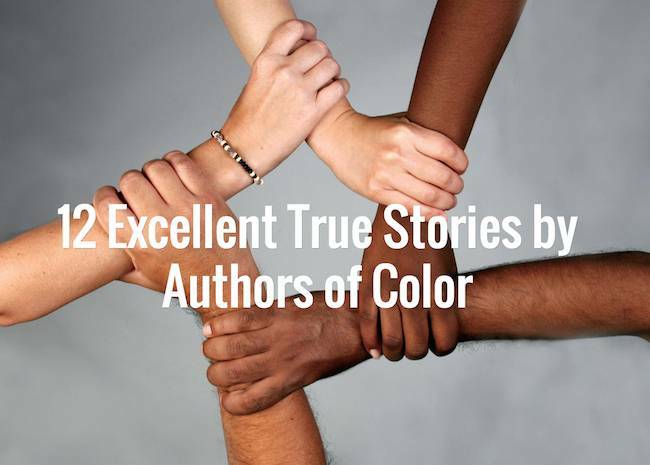 When we asked Riot readers to share their favorite authors of color, we got a great list. But it was also pretty skewed towards fiction. Because I love nonfiction, I decided to put together a couple of lists of nonfiction by authors of color for other readers. As I said in my post on memoirs, this list is nowhere near exhaustive. I’d love to hear more suggestions in the comments. I had a surprisingly hard time coming up with books for this list — my own shelves are very heavily weighted with books from white authors. Special thanks to Rioters Sarah Rettger and Jeff O’Neal for contributing to this list. From 1915 to 1970, this exodus of almost six million people changed the face of America. Isabel Wilkerson compares this epic migration to the migrations of other peoples in history. She interviewed more than a thousand people, and gained access to new data and official records, to write this definitive and vividly dramatic account of how these American journeys unfolded, altering our cities, our country, and ourselves. When Jeff Chu came out to his parents as a gay man, his devout Christian mother cried. And cried. Every time she looked at him. For months. As a journalist and a believer, Chu knew that he had to get to the heart of a question that had been haunting him for years: Does Jesus really love me? The quest to find an answer propels Chu on a remarkable cross-country journey to discover the God “forbidden to him” because of his sexuality. Every day we make choices. Coke or Pepsi? Save or spend? Stay or go? Whether mundane or life-altering, these choices define us and shape our lives. Sheena Iyengar asks the difficult questions about how and why we choose: Is the desire for choice innate or bound by culture? Why do we sometimes choose against our best interests? How much control do we really have over what we choose? The struggle to perform well is universal: each one of us faces fatigue, limited resources, and imperfect abilities in whatever we do. But nowhere is this drive to do better more important than in medicine, where lives are on the line with every decision. In his new book, Atul Gawande explores how doctors strive to close the gap between best intentions and best performance in the face of obstacles that sometimes seem insurmountable. When first-year graduate student Sudhir Venkatesh walked into an abandoned building in one of Chicago’s most notorious housing projects, he hoped to find a few people willing to take a multiple-choice survey on urban poverty–and impress his professors with his boldness. He never imagined that as a result of this assignment he would befriend a gang leader named JT and spend the better part of a decade embedded inside the projects under JT’s protection. This epic work tells the story of the Hemingses, whose close blood ties to our third president had been systematically expunged from American history until very recently. Now, historian and legal scholar Annette Gordon-Reed traces the Hemings family from its origins in Virginia in the 1700s to the family s dispersal after Jefferson’s death in 1826. To be Latino in the United States in the twentieth and twenty-first centuries has meant to fierce identification with roots, with forbears, with the language, art and food your people came here with. … Living in Spanglish delves deep into the individual’s response to Latino stereotypes and suggests that their ability to hold on to their heritage, while at the same time working to create a culture that is entirely new, is a key component of America’s future. The story of cancer is a story of human ingenuity, resilience, and perseverance, but also of hubris, paternalism, and misperception. Siddhartha Mukherjee recounts centuries of discoveries, setbacks, victories, and deaths, told through the eyes of his predecessors and peers, training their wits against an infinitely resourceful adversary that, just three decades ago, was thought to be easily vanquished in an all-out “war against cancer.” The book reads like a literary thriller with cancer as the protagonist. In 2003, The Washington Post’s Anthony Shadid went to war in Iraq, but not as an embedded journalist. Born and raised in Oklahoma, of Lebanese descent, Shadid, a fluent Arabic speaker, has spent the last three years dividing his time between Washington, D.C., and Baghdad. The only journalist to win a Pulitzer Prize for his extraordinary coverage of Iraq, Shadid is also the only writer to describe the human story of ordinary Iraqis weathering the unexpected impact of America’s invasion and occupation. this book directly challenges the notion that the election of Barack Obama signals a new era of colorblindness. With dazzling candor, legal scholar Michelle Alexander argues that “we have not ended racial caste in America; we have merely redesigned it.” By targeting black men through the War on Drugs and decimating communities of color, the U.S. criminal justice system functions as a contemporary system of racial control—relegating millions to a permanent second-class status—even as it formally adheres to the principle of colorblindness. Amy Chua argues that Western parenting tries to respect and nurture children’s individuality, while Chinese parents typically believe that arming children with skills, strong work habits, and inner confidence prepares them best for the future. Battle Hymn of the Tiger Mother chronicles Chua’s iron-willed decision to raise her daughters, Sophia and Lulu, the Chinese way – and the remarkable, sometimes heartbreaking results her choice inspires.